Previously I have written a blog of a short jog I had run around the sites of the old grounds of Partick Thistle Football Club. For a look at some information I came across on the old grounds whilst investigating this route please have a look at the earlier blog. 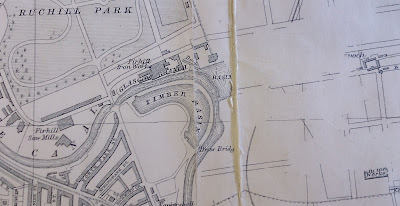 Simon McKay added a comment to it that I had probably guessed wrongly on placing the Meadowside ground so near to the end of the River Kelvin. Partick Thistle played here from 1897 to 1908 in a ground which once held 16,000 people watching a match against Hibernian. 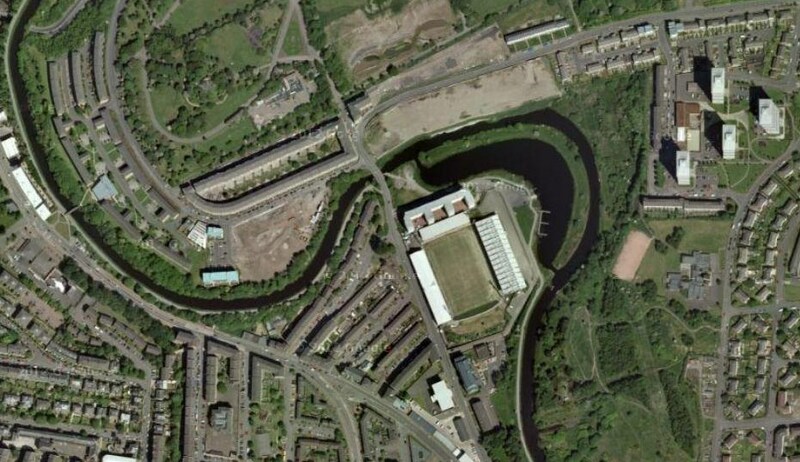 In 1908 they moved to where they are still, in Maryhill, the ground partly surrounded by a bend in the Forth and Clyde Canal and the Firhill Basin that was once used for off-loading timber. I apologise in advance that this blog is a bit heavy on pictures because of the nature of it, so if reading this on a mobile, you were warned! Last week on a trip through to Edinburgh with my children we popped into the National Library of Scotland and had a quick look at an exhibition about map makers Bartholomew. 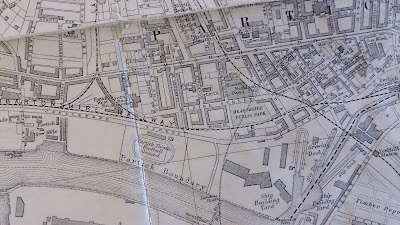 They had a Glasgow map on display labelled 1888, but it had Partick Thistle's stadium in Maryhill already in place, so was obviously a later map. 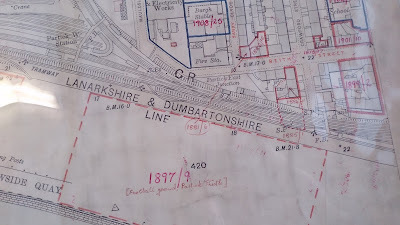 This made me remember that I'd planned to have a look in the Glasgow Room in the Mitchell Library to see if I could find any old maps giving more clues to the location of Partick Thistle's Meadowside ground. I love guddling about in this room and I can easily lose track of time whilst in here, so I quickly got distracted looking at a lot of other stuff today. So here is a quick run through some of the old maps that I came across. Somewhere just south of Dumbarton Road lies the site of Partick Thistle's earliest recorded home, Overnewton Park. On current maps Overnewton Square is as near as I can guess to where this used to lie. 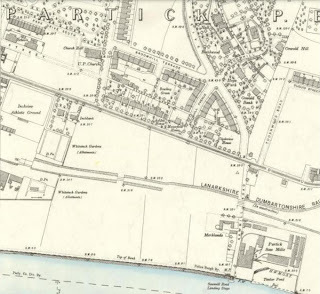 In this 1865 map "Overnewton" lies between Kelvinhaugh Road (now Haugh Road) and Kelvinhaugh Street. I stumbled across no maps with a pitch marked on them. 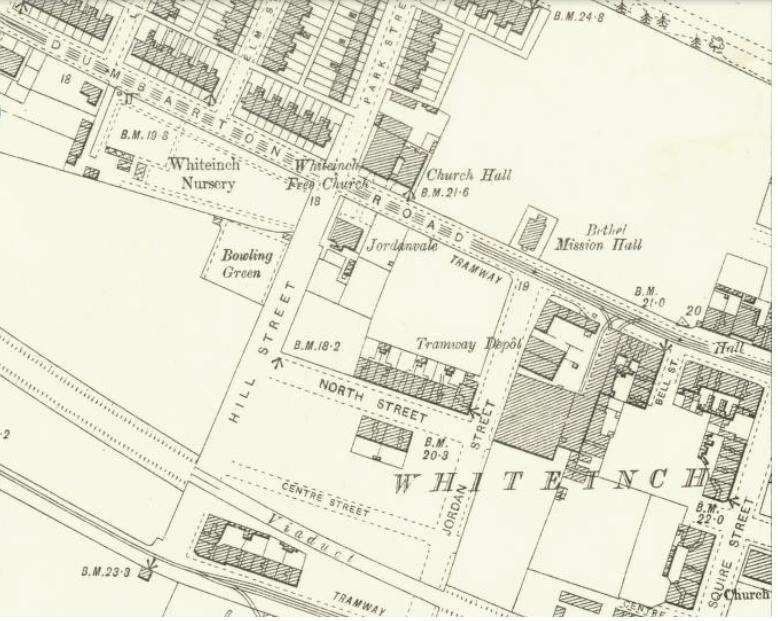 This ground lay just south of Dumbarton Road, beside what is now called Edzell Street (was called Hill Street) in Whiteinch. The pitch here was problematic and after 3 years they moved back westwards. 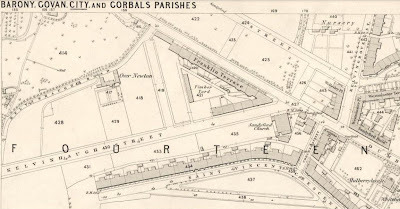 The area was later used for a tram depot which can be seen on this 1898 map. 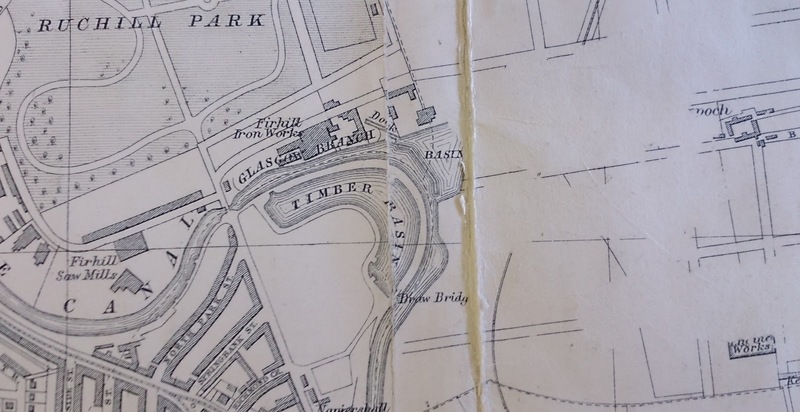 Muir Park now lies under the bottom of Gardner Street in Partick, but before the rising population made building tenement housing a profitable enterprise this area was laid out as Muir Park. 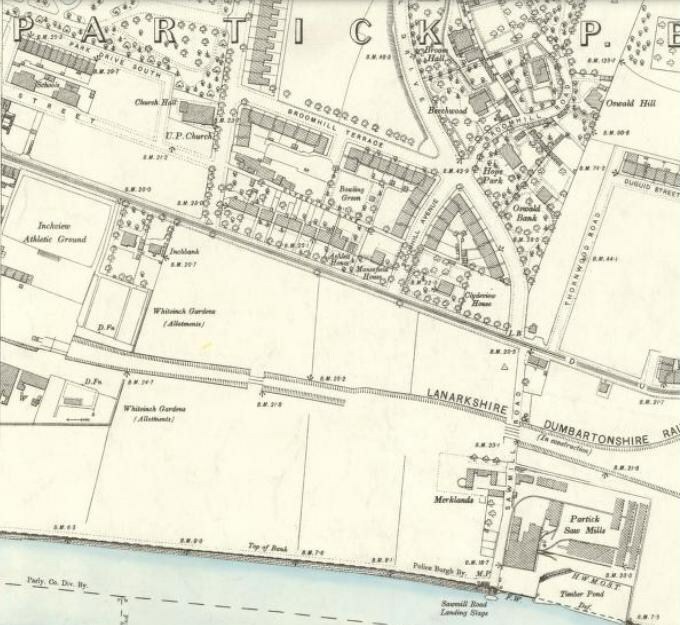 On this map of 1861 you can see the West of Scotland Cricket ground on the left and the bowling green on what is now Fortrose Street which are both still there. The curling pond on Peel Street is now long gone. Thistle had their pitch at the lower end of Muir Park (between the P and A of Partick in this map). 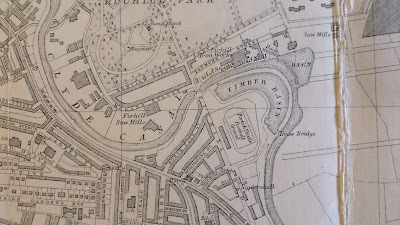 In 1885 Partick Thistle played their last game at Muir Park, against Partick FC, who were being wound up, and moved to their ground in Whiteinch - Inchview. This now lies roughly under the northern entrance to the Clyde Tunnel. 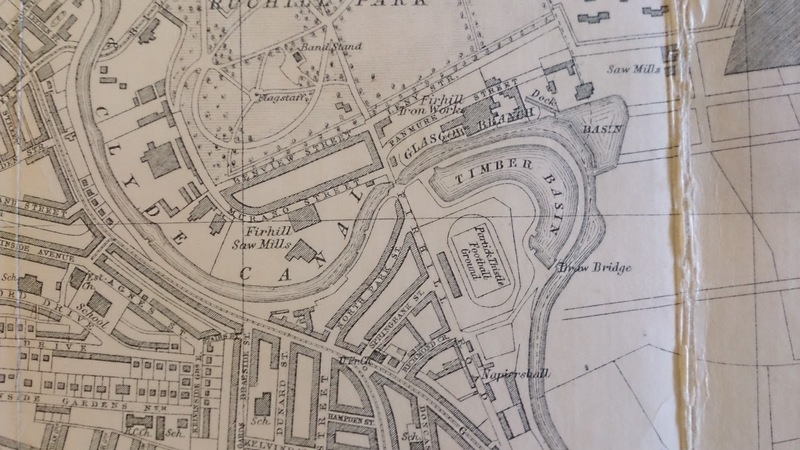 In this map of 1896 "Inchview Athletic Ground" can be seen on the left hand edge, just south of Dumbarton Road. Meadowside shipyard, with Clyde off to the top. In 1897, as one contemporary report put it "The Partick Thistle, urged no doubts by the encroachments of the avaricious building fiend, have decided to remove to larger fields and pastures more central". I had thought this was on the Clydeside near the mouth of the River Kelvin, with Thistle having to move for the building of a shipyard here. However my wife came across a reference in a Jules Verne book set in Glasgow ("The Blockade Runners") to the Meadowside shipyard, which was built here much earlier, in 1844. It even has a wee photo of this area, so I placed it wrongly in my earlier blog﻿﻿. In this picture above, the Kelvin is in the foreground, the Clyde heading upwards to the sea. The building in the centre is all that remains of this complex now and Partick Thistle built their ground on the grassy bit beside the Clyde just west of the shipyard. These maps below are a kind of before and after shot of Meadowside. The first is from 1892 and has ("1897 Football Ground Partick Thistle") added as an amendment. The second shows the ground and maybe explains why two boats were allegedly required to retrieve stray footballs from the Clyde on match days. This places the ground in a line straight south from what is now Sandy Road, under the two most eastern blocks of flats in the new Glasgow Harbour development. It was the building of the Meadowside Granary which required Thistle to find a new home. 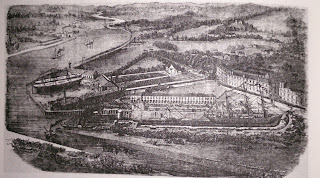 When they had to move away from the land at Meadowside for industrial development on the Clydeside, a piece of land was procured in Maryhill, a pitch flattened out and a stand for 1600 people built. 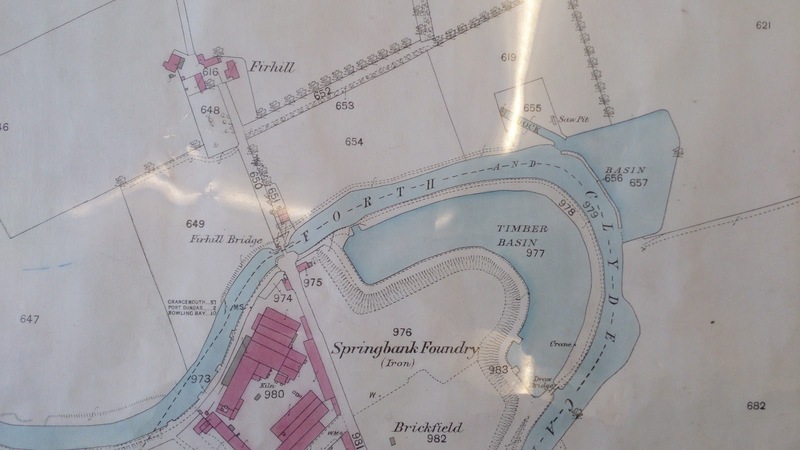 In the 1861 map what is now Firhill Road leads over Firhill Bridge to what looks like a farm called Firhill. Where the stadium would later be built lies an iron foundry, adjacent to the "timber basin". 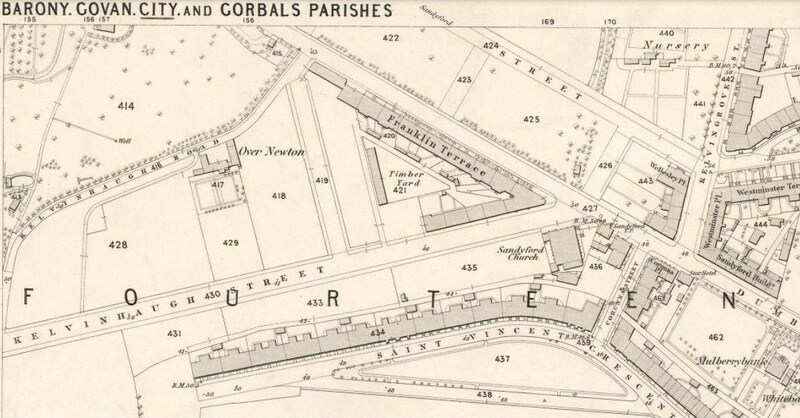 By the 1898 maps the foundry has gone and the "Firhill" house has been replaced by Ruchill Park. 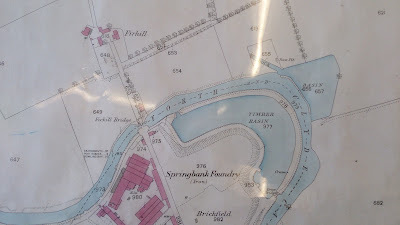 On the north bank of the canal now lies "Firhill Iron Works" and "Firhill Saw Mills" as industrialisation moves on apace. By the year 1921, when Partick Thistle won the Scottish Cup you can see the stadium on the maps. Earlier maps have just the main stand and indicate a rough slope for the terracing but by 1921 it looks more recognisable on the maps. Murano Street has been laid out now (named after Murano Glass Works in Venice as there were two large scale glass works on this street). Curiously what is now called Bonawe Street on the other side of Maryhill Road, was called Hampden Street in 1921, which seems appropriate that season (or not, as one pedant has pointed out Thistle won the Scottish Cup final that year played at Celtic Park). Anyway that was what I found in the Mitchell Library today. Please let me know if there are any glaring errors here and I'll put these pictures up on the Partick Thistle FC flickr page if you want to have a look at bigger versions. Great stuff. Interesting for Thistle fans and other folk interested in Glasgow history. Hello! Just came across this wile trying to find older street maps of Partick. My husband's mother's family lived there for several generations. 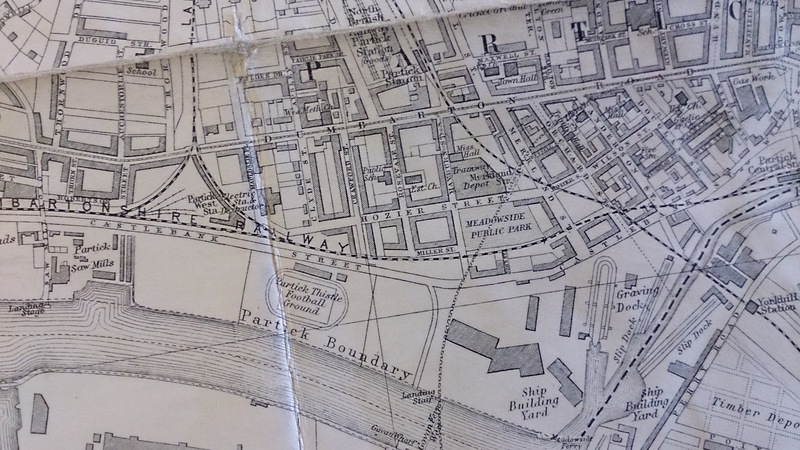 Do you have a good-quality picture of a bit more of the 1903 Meadowside area map you shared here? 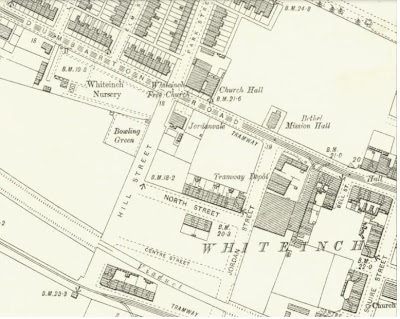 That is perfect for my needs, as it shows Castlebank Street and the rest of the streets off it where my husband's ancestors lived, but I am looking a bit north of what that map shows as well, to see if I can locate a "Wallace Place" -- a location where some of our lived during the late 19th Century Censuses.